Major trauma centres are set up to provide this specialised care; they are hubs that work closely with a series of local trauma units. Major trauma centres operate 24 hours a day, seven days a week. They are staffed by consultant-led specialist teams with access to the best diagnostic and treatment facilities, including orthopaedics, neurosurgery and radiology teams. What is a Major Trauma Network? Major trauma networks comprise of a collection of service-providers and personnel, who serve a defined population and aim to reduce death and disability following injury ensuring the best quality care in the right place, at the right time for these complex injuries. 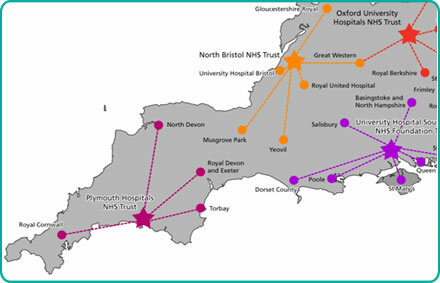 Each network is served by one or more Major Trauma Centres, along with a number of smaller hospitals called trauma units (TUs), and several pre-hospital care providers. Since the introduction of these networks in England, critically injured patients now have a 30% better chance of survival. The latest statistics for the Severn Major Trauma Network can be found on the TARN (trauma audit and research network).